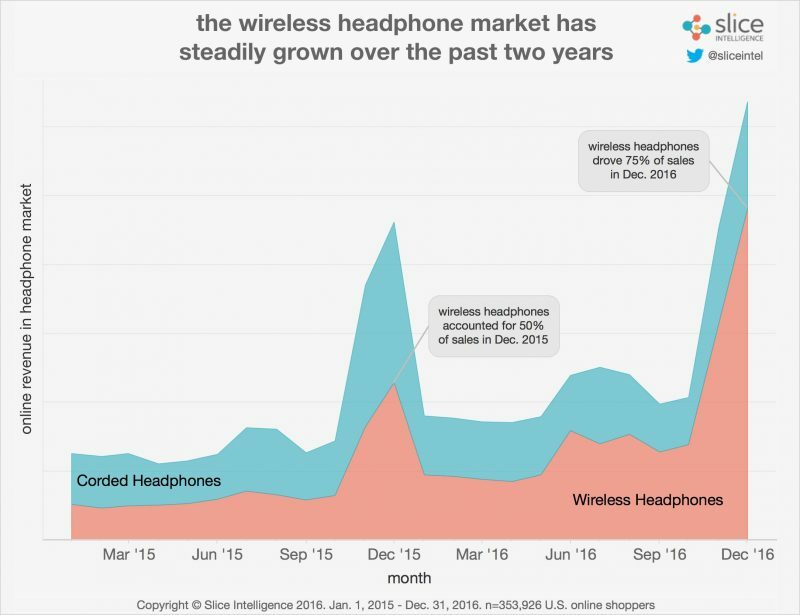 The wireless headphone market has steadily grown over the past year, new data from research firm Slice Intelligence suggests. In the U.S. last month, an estimated 75% of revenue from headphones sold online came from wireless models, up from 50% in December 2015, according to Slice Intelligence. 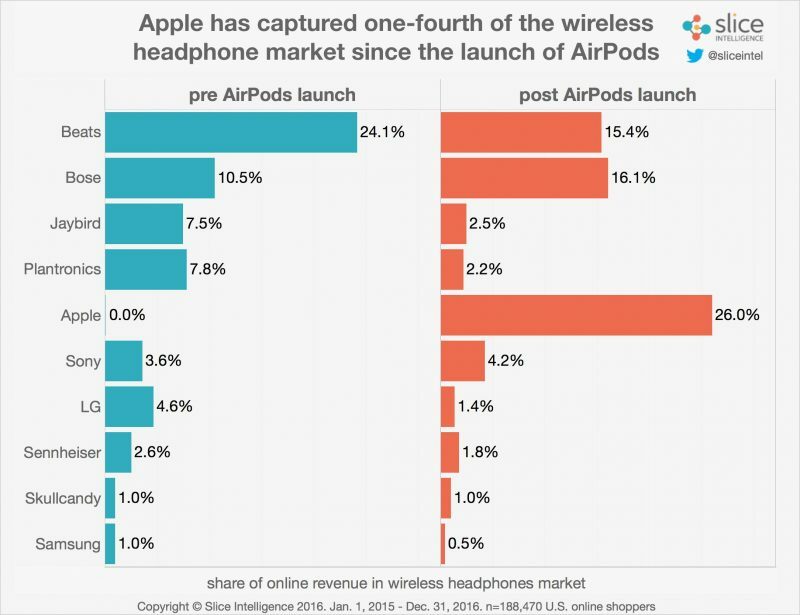 Apple's new AirPods led the way, capturing an estimated 26% share of online revenue in the wireless headphone market since launching on December 13. AirPods stole the top spot from Beats, which took an estimated 15.4% of online revenue in the wireless headphone market, down from 24.1% between the start of 2015 and December 13. Given it owns Beats, Apple appears to have actually taken nearly 40% of online revenue in the market since launching AirPods. Slice Intelligence said wireless headphone spending on AirPods launch day was ten times greater than the pre-holiday average for 2016. December 13 was also the largest single day of online headphone spending last year, according to the research firm, topping Amazon Prime Day, Black Friday, and Cyber Monday. 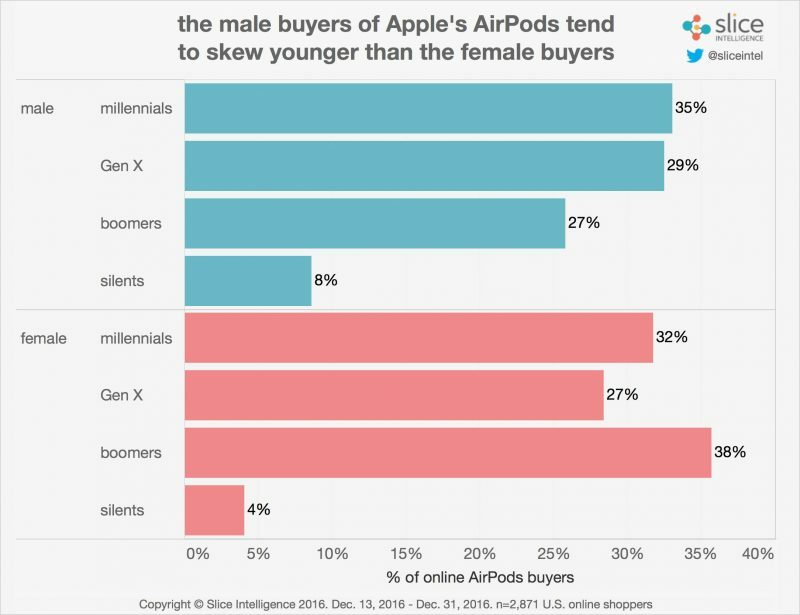 The research suggests 85% of shoppers who purchased AirPods are male, of which 35% are young millennials. Female buyers tended to skew older, with 38% falling in the baby boomer generation. The gender data is based on 2,871 U.S. online shoppers who purchased AirPods between December 13 and December 31. Apple has not disclosed AirPods sales, with CEO Tim Cook only vaguely claiming the wireless headphones have been a "runaway success" amid "a great holiday" period. AirPods remain estimated to ship in 6 weeks in the U.S. as Apple said it is working to fulfill orders as fast as possible. Slice Intelligence aggregated its data based on anonymized e-receipts from up to 353,926 U.S. online shoppers—the size of the user base varies per chart. But without official figures, it is impossible to determine if the data is accurate—Apple could easily follow up with very different numbers. If they fit your ears they truly are one of the best options when you consider price/quality/compatibility/features. Easy to see why they're one of the top sellers in the wireless headphone market. It's also long past time for the many pundits who criticized the Beats deal to acknowledge that it was an ingenious acquisition. Everybody focused on the streaming aspects, itself worthwhile, but most didn't realize the enormous value in the headphone business. Whatever you think of the audio quality of the Beats, they are enormously profitable based on markup and sales volume. From that perspective alone, Apple got a bargain and Apple is now the largest seller of wireless headphones in the world, and they have over 60% of the world wide market for premium headphones. Kudos to Tim Cook for his business acumen in this purchase. Please don't give me this "people buy it because of the Apple logo" BS! You create a nice product, people will buy it. This doesn't actually look great... Apple owns Beats. So they cannibalized their own sales, but the real winner was Bose. Their segment of the market increased during this same time period. Not much to celebrate if you're Apple. A quarter of all online sales within a month of releasing a brand-new product in a category they've never entered? Not much to celebrate?! By golly, you naysayers are incredibly deluded. Any other company would give their figurative right arm for sales like this. Let me absolutely assure you: if Microsoft had bought Beats and if Microsoft had released a wireless headphone that was even half as successful as this, you'd be the same person saying that Apple dropped the ball, and Cook has the foresight of a mole wearing a blindfold. These are staggering sales numbers. you're not allowed to say anything positive about Tim Cook around these parts. I think they're great, I just wish there was a setting to skip a track with a double tap. Other than that, battery life is great, charge time is quick, and they sound decent. That's a pretty difficult thing for me to admit, because I really didn't like or agree with the acquisition at the time, plus Dre's arrogant attitude about the whole affair gave me a rotten feeling. In hindsight though, what you say is absolutely the truth (appropriate username). Even if you think that they overpaid for Beats, the products that have come from a result of the purchase have already covered those initial costs. I'm glad the AirPods still use the same charger as the iPhone. Far more likely that I'll need to charge the AirPods when I have an iphone charger with me than the USB C cable that currently only powers 2 products in Apple's lineup. Very true. The fact that the Airpods use the same lightning port as other Apple's ports is huge. Can you imagine the backlash if Apple would have made a completely different charging method? Personally, I like the fact Apple included the charging cable as well. Never hurts to have more than charging cable around. Honestly, I ordered them because they weren't crazy expensive at $159 price point, I wanted to try them, and I got my order in before the wait was crazy. I received them the week of Christmas, and they made me return my Bragi Dash, and although the sound quality isn't amazing as my Shure e5c's, I still prefer these to any of my other headphones, especially when switching quickly between Mac, iPad, and iPhone.